Syrians use dirt to put out a fire at the scene of a reported airstrike in the district of Jisr al-Shughur, in the Idlib province, Sept. 4, 2018. The United States promises to "respond swiftly and appropriately" if Syria uses chemical weapons in Idlib province, the last rebel stronghold in Syria. The White House said Tuesday it is "closely monitoring" the fate of Idlib, where it said "millions of innocent civilians are under threat of an imminent ... attack" by the regime of President Bashar al-Assad. It said President Donald Trump "has warned that such an attack would be a reckless escalation of an already tragic conflict." The White House said it "will continue to work tirelessly with its allies to find a lasting diplomatic solution to resolve the hostilities in Syria" under a United Nations Security Council resolution. A Syrian man rides a motorcycle past a destroyed building in an area that was hit by a reported airstrike in the district of Jisr al-Shughur, in the Idlib province, Sept. 4, 2018. ​Russia and Iran back the Assad regime and say they support Syria's efforts to retake Idlib. Kremlin spokesman Dmitry Peskov said Idlib is a pocket of terrorism and that the situation there is undermining efforts to find a political resolution to the Syrian conflict. The Iranian foreign ministry said Idlib should be cleared of "terrorists" and that reconstruction efforts and the return of refugees should go forward. 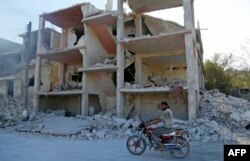 Syria, Russia and Iran use the word "terrorists" when talking about Syrian rebels. There are about 3 million people in Idlib, and the U.N. said it is worried about the potential humanitarian toll that may come with a Syrian military campaign there. Trump warned Syria in a tweet Monday night to not "recklessly attack" Idlib. He also called on Russia and Iran to show restraint. Trinity University history professor David Lesch told VOA that while the Trump administration is "ratcheting up the pressure a little bit" beyond its previous warnings against a chemical attack, U.S. influence on what happens in Idlb is limited. "Frankly speaking, I don't think there's anything the United States can do about it. I think Russia and the Syrian government and their allies are dead set on taking over Idlib, either in a phased way or in an all-out massive invasion," Lesch said. 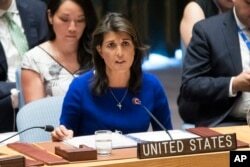 U.S. ambassador to the U.N. Nikki Haley said the Security Council will meet Friday to discuss the situation. Syria has been at war since early 2011. A multitude of parties, including pro-government forces, rebel groups and militants, are all fighting for control over various areas. Assad's forces, backed by military support from Russia and Iran, have recaptured major cities in recent years after giving rebel fighters, families and other civilians the chance to flee, instead of facing a military onslaught. Meanwhile, suspected Israeli jets struck military targets inside Syria's Hama and Tartous provinces Tuesday, killing at least one person, Syrian state media reports. The report said Syrian air defenses intercepted some of the Israeli rockets. Israel has not confirmed Tuesday's airstrikes. But a top Israeli defense official acknowledged Tuesday that Israeli jets have struck 200 Iranian military targets inside Syria since 2016. Israel has said Iran must not be allowed to have a permanent military presence inside Syria.